It’s tough to be a foodie, a chocoholic, and an athlete at the same time! So yes, I need to stay fit, wanna stay healthy, and I have to indulge! (especially during the holidays.) So what’s a girl to do when faced with this kind of dilemma? As I always say, it’s all about choices. So I’m always on the lookout for healthy options or, makeovers of my favorite not-so-healthy foods. I stumbled upon this website recently (thank you John Romaniello), and I will be back!! It’s called www.tgipaleo.com (clever!) There are some fabulous recipes there-most of which you could make a case for being healthier versions of some of your favorites. But this one….oh…this one stole my heart :) …. Beat the ingredients for the cookie dough together, then set aside. Do the same for the fudge. 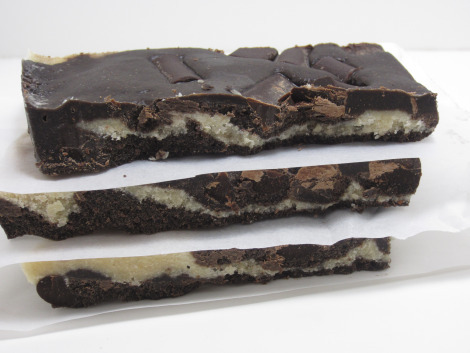 In an 8×8 dish lined with parchment paper, press half of the fudge mixture into the bottom. Press all of the cookie dough on top (it doesn’t have to be pretty, don’t worry). Then press on the last half of the fudge. Refrigerate for 2-3 hours, or until firm. Or you can just start spooning it out right then, I won’t judge. What is a Detox Program and Do You Need One?